Ryan Coogler’s Black Panther is now one of the highest grossing films of all-time, and it’s not all thanks to Chadwick Boseman and Michael B. Jordan. A huge portion of the film’s success rests with its heroines: King T'Challa's love interest, Nakia (Lupita Nyong’o); his sister, Shuri (Letitia Wright); General Okoye (Danai Gurira); and the Dora Milaje soldiers charged with protecting Wakanda. While most action films relegate women to being either damsels in distress or beautiful, one-dimensional love interests of the male protagonist, Black Panther does the opposite. Although its heroines are technically supporting characters, their strength and unfettered courage catapult them into leading ladies. 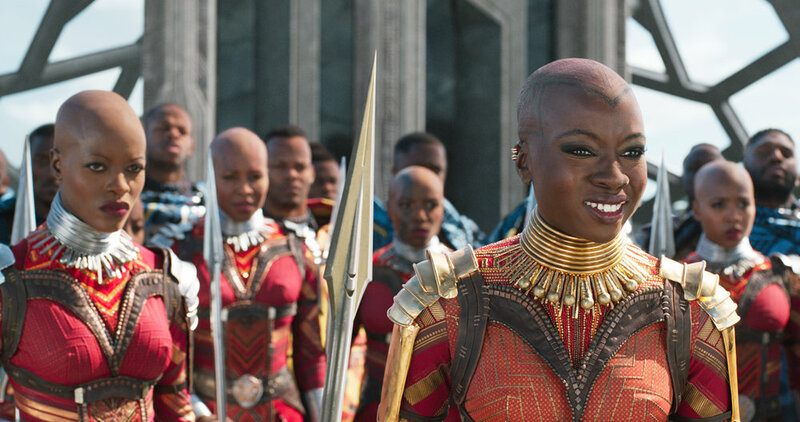 In the film, the country of Wakanda is protected by the Dora Milaje, an army of women warriors. They are the country’s first and only defense and the king’s trusted personal bodyguards. Trained from birth in weaponry, the martial arts, and hand-to-hand combat, the skilled soldiers can go toe to toe with any man. When the kingdom is at risk of being destroyed by Killmonger, the Dora Milaje, under the leadership of formidable General Okoye, fight to save it. The emotional fortitude of Black women is commonplace in American cinema: our strength as mothers, survivors, and those who rise above is well documented in movies like Kidnap (2017) with Halle Berry, Precious (2009) starring Mo’Nique, and What’s Love Got to Do with It (1993) with Angela Bassett. What is not as well documented is our physical strength, particularly in battle. The women warriors of Wakanda present a new image of Black womanhood — that of the woman warrior. Their eyes spark fear, and their battle gear covers their entire bodies and consists of pants (not briefs) and strategically placed strips of armor, accented with the body length spears gripped in their hands. They are fierce. And their hair — or lack thereof — speaks volumes. While buzz cuts are presented as e\in vogue for America’s fiercest women soldiers, as portrayed in G.I. Jane (1997) with Demi Moore, the Dora Milaje forego hair altogether. In a time where Black people are being policed by employers about their natural hair, and Black women still have to write books titled, “You Can’t Touch My Hair,” these soldiers’ refusal to have any at all — at least on their heads—is a political act. Black Panther makes is clear where our attention should be — on the warriors’ skills. Realizing that Okoye can and will kill him, he drops to his knees in surrender, and his fellow soldiers follow suit. W’Kabi’s kneeling is significant, because he essentially acknowledges that Okoye is the more skilled warrior. He abandons his ego in front of her and every one of his men, creating what will go down as one of cinema’s most memorable moments. Just as memorable is the image of a Black woman, or any woman, whose love life takes a backseat to her number one passion: her people. This commitment to country and cause over love is also evident in Nakia’s relationship with T’Challa. From the film’s onset, it’s clear that love abounds between the two, yet Nakia refuses T’Challa because her first priority is aiding her fellow Africans. It is only at the end of the film, after T'Challa commits to providing aid, that she in turn commits to him. She is the on-screen Black heroine we’ve been waiting for: a woman who loves as lavishly as she wars. Coogler’s Black Panther powerfully depicts a world where art supersedes life. His Dora Milaje soldiers are just as deadly as the real-life women warriors who once protected an African nation, but more liberated than they ever were. In the late 17th century, King Wegbaja of the West African nation of Dahomey (now the Republic of Benin) created a troop of all-women warriors called the N’Nonmiton. Like the Dora Milaje, the N’Nonmiton protected king and country. They were such skilled fighters that were nicknamed “Amazons.” But unlike the Dora Milaje, they were forced either to remain celibate or marry the king or one of his dignitaries. These women could decide neither whom they loved or if they loved. They fought on the front lines until Dahomey was conquered by the French in the late 19th century. Hopefully one day soon, life will imitate this groundbreaking work of art.